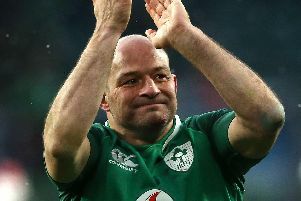 Rory Best admitted Ulster would look back at the defeat against Racing 92 on Saturday evening with a sense of frustration that they were unable to take more from it. Although the Pool Four favourites were 44-12 winners, the scoreline did not reflect the effort the Ulstermen had put in. Few had expected them to win in the indoor La Defense Arena, but there was a feeling they could have returned from Paris with something. At one point, Ulster leading 12-3 at they did after 20 minutes, there was a real sense of getting something from the game. Reality arrived quickly as Ulster trailed 20-12 at the break. However, even when 30-12 behind, Ulster rallied and only for enforced errors could have got on the scoresheet again. Racing moved top of the Pool Four with two wins from two, Ulster dropping to third place after Leicester’s bonus point win over Scarlets. But with Ulster due to meet the Welsh side in back to back fixtures in December, there remains high hopes that the Irish Province can at least, at a minimum, finish runners-up in the group. “We will look back at the game (against Racing) with a degree of frustration,” said Best. That was in reference to the French side’s two tries, Ulster caught napping as a scrum was turned and then unable to react quickly enough at a turnover. Both moments were pivotal. Ulster are a side in transition and the win over Leicester, and some other results, this season have seen them take some steps forwards. “There were aspects we were happy with and other aspects we were not. “Perhaps it shows the difference between a team who are among the favourites to win the competition and a team that are trying to take a step forward where they can win tight games,” said Best.